Determine if you need a certified copy or just a photocopy. A certified copy has an official stamp on it, whereas a regular photocopy does not. If you need the form for any official legal purpose, such as changing your name after a divorce, you need a certified copy. Look up the date, location and case number of your divorce case, if you don't already know it. 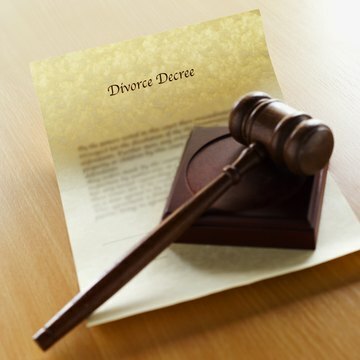 The case number is assigned when you file the paperwork in the divorce. You can find it at the top of each page of the documents filed at the courthouse. Contact the district clerk at the courthouse where the divorce was granted or access their website. Each county has its own rules and fees, so you need the specific information for your location. Contact information for each district clerk is available at the Texas State Department of Health Services website. Download the required form for requesting copies that your county provides online. Alternatively, if you go to the courthouse, the clerk will provide the form to you. Each county has its own form. Fill out the form as completely as possible. If you do not know the case number, the clerk's office can locate this information for you for an additional fee. Indicate whether you need a photocopy or a certified copy. Pay the required fee. Typically, you will be charged a flat fee per page, a certification fee and, if you ask them to find the file instead of providing the case number yourself, a research fee. If you request copies by mail, you may pay by credit card or check. Email requests require a credit card. If you go to the courthouse, most counties allow you to pay by cash, money order, credit card and possibly personal check. Indicate how you want the copies provided to you. If you want them mailed to you, the clerk's office will either charge you a mailing fee or ask you to enclose a self-addressed stamped envelope with your mailed request. Unless your file is stored off-site or is on microfilm, you should be able to pick the copies up on the same day you requested them, if you went to the courthouse. However, it can take several weeks to several months to receive your copies by mail, depending on the difficulty of locating your records.